BTW, I’m making Growing Sakura (commercial) remake and I need help of composer to do music/sounds for that. Tweet me please if you are a composer and you are interested or write something in comments. Also play Growing Sakura if you still didn’t! Just made Linux builds of my puzzle game Growing Sakura (rate it!) and created the game page on Itch.io. Finished on the last minutes and submitted about 15 minutes before end of the Submission Hour. In the last hour I’ve finished all 40 levels. I’m not sure about quality of the last ones. I know it’s possible to solve all of them and the last ones should be incredible hard, but I don’t know how much hard they are because I had no time to solve them. But I’ve verified that they have solutions by my beautiful Sakura solver. Clicking the “?” button sends you to the help page. Also I’ve added a few sounds (I tried to do them in japanese style, but looks like they are actualy in chinese style) and saving the progress in the save-file. Sorry, it saves only which levels were solved, not solutions. It also forgets about your solution when you leave the current level. Yet another thing: the game mechanics allow multiple root buds. The levels are most enjoyable to play (and not so enjoyable for my solver). On the picture you can see that the solver spent 7 seconds for about 700 thousand moves to check all possibilities and found an unique solution. The last weird line is short representation of the level, which the game can parse. Also I’ve made a menu, words on the buttons were replaced by pictograms. Short info about rules: click on a bud by the left mouse button makes “Y” fork and click on it by the right mouse button makes “I” fork. It doesn’t create branches if it’s impossible (hint: clicking on buds in right order is very important). The goal is to cover all the cells. You can see, I tried to visualize it in japanese “sakura” style. I implemented all mechanics of the game (“Undo” button too). Work for the tommorow: make a menu, design as many puzzles as possible, sound, music, and polishing. Hope not so bad idea at all. And I have no sense how difficult it can be. Also I control it using two mouse buttons only. Language: C++, my base code can be found here. IDE: Visual Studio 2008 Express Edition. Libraries: FLTK, OpenGL, OpenAL, mpg123. Possible I’ll use Tiled Editor and Bosca Seoil. Hope the theme will be interesting. Well, I’ve done something playable. Moreover, it’s enjoyable! You are a fireman turned on road full of zombies. Mount your fire hose to hydrants and defense yourself by water jets! Sorry, no sound. When I’ve done crazy “Brains!” sounds by microphone, I’ve discovered that they are in WMA and when I’ve converted them into WAV, my sound engine couldn’t load it because of wrong format (dunno what it doesn’t like, Winamp can play it). The last half of hour to fix that – and unfortunately fail. Too bad I had not so many time for this Ludum Dare. Anyway, I’ve created some prototype. It’s game about Fireman who fights against zombies using… water jet. I think it will be only survival mode with some bonuses like: more power to the water jet, longer fire hose, more water in the fire hydrants, etc. Well, I have 4 hours to implement it. Also it’s possible (depending on the theme) I’ll drop all this and will use JS+HTML5+Canvas and will write all code from scratch. Unfortunately I’ll be a bit busy this weekend (because of really unexpected events), so this 48 hour compo actually will be 8-10 hours compo for me. But I hope I’ll have enough of time to make something minimalistic. Ludum Dare page of the game is here. Submitted the archive on the last minutes. Spent so many time for setting true initial state of the game (I changed it for testing to don’t walk from the beginning). So, there is a small Zelda clone. Unfortunately it’s not finished, but playable enough. A cool dialogue-quest system is implemented and 2 temples of 3 are finished (you know – dungeons, keys, doors, switches, etc…). The 3rd temple is designed but I had no time to implement one interesting game mechanics and quest-chain to reach this temple. Maybe I’ll finish all that I planned as post compo version. Play and rate it here! Small hint: if the game window is too small for your display or you cannot force your eyes to see small details – use Q to scale “gameplay” window. It was not enough of time for me to finish my grandiose game, so I’m taking an extra day. Dunno why gifs are accelerated… In the game it’s a bit slower. 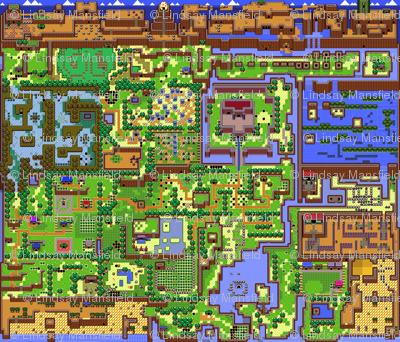 Finished the world map, 99% of sprites are done. The idea is to draw on the screen whole world map and move over it small window with the current gameplay. For the first day I have drawn about 70% of the world map from scratch using Paint, Adobe Kuler and Tiled Map Editor. Remaining 30% is not so long to do because almost all tiles are ready now. As you can see, I’m going to make really compact Zelda clone. Still no one line of code, but I hope I’ll have time to finish it tomorrow because I have retained only a few game mechanics from the original Zelda. In the worst case I’ll finish it during Jam. Now I’m going to sleep… Good night!